Please join us in extending Larisa Aukon a HUGE WELCOME to the Thomas Kearns McCarthey Gallery! 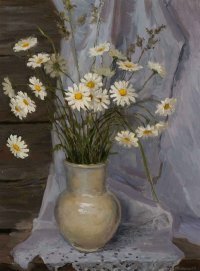 Born in Riga Latvia, Larisa is a classically trained painter, receiving her formal education from the Latvian State Academy of Fine Arts. With her masterful use of color, textural brushstrokes, lush and complex palettes, Larisa creates amazingly compelling works that excite the senses and draws in the viewer. Today, Larisa calls Arizona home where she derives inspiration for her expressive and colorful style. Over the last few years, Larisa Aukon has burst onto the national art scene with numerous solo exhibitions throughout the Southwest, features in several Art Magazines, and many top awards. Larisa's works are held in many private and corporate collections throughout the U.S., Canada, England, Italy, Germany, Sweden, Poland, Latvia and Russia. I paint powerful, compelling expressionist images of both natural and urban landscapes, infusing everyday objects with spiritual qualities, bringing my subjects alive. Within each painting I strive to "capture the unseen spirit that exists in the wild," and thus the perfection and diversity that surrounds us. The world we live in is fascinating to me, and this fascination becomes palpable when I apply paint to canvas. A hallmark of my work is masterful use of color and textural brushstroke framed in representational contexts. My palettes are lush and complex, resulting in layers upon layers of brilliant hues and an intricate use of light and shadow that lends depth and intensity to each composition. Compositions are balanced and strong, conveying the inherent harmony and synchronicity that I see in the world around me. What results are compelling works that excite the senses and draw the viewer in. For me, the creative process is intimate and personal, and to paint I must completely immerse myself in the subject. I spend ample time out in the field working on compositional sketches and plein air preliminary paintings before I ever set foot in her studio. I need to thoroughly know my subject before I start painting. I have to see it, feel it, and be connected to it. To paint a landscape, I have to experience it. Above all, my art is fueled by the beauty I am able to see in the world and my dedication to preserving that beauty so that others are able to see its power and potential as well. My greatest hope is that my art captures the imagination of the audience, forcing them to really pay attention to the world around them and to listen closely to what nature is whispering to us all. I truly believe there is an inner 'pulse' that runs through everything, mostly unseen but more often felt. I can think of no greater artistic inspiration than identifying this current and holding it in my heart long enough to translate it to canvas. Sometimes, in an unforgettable moment, the most mundane idea takes on an astonishing realness, and the way we see the world is forever changed. 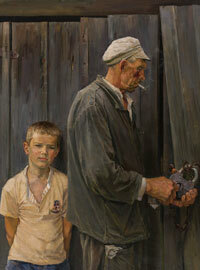 Latvian-born painter Larisa Aukon had a moment like this not long after immigrating to the United States 15 years ago. Until then, the enthusiastic redhead had spent all her life in the Latvian capital of Riga, a good-sized northern European city on the Baltic Sea. After moving to Arizona, she found herself sitting on a hill one day overlooking an endless expanse. "I could see a long way," she recalls. "For the first time in my life I had the feeling that I lived on a planet-not in Riga, on a street, but on a planet. It was very powerful." This sudden, surprising shift in Aukon's vision of the world remained with her, underscoring what became an instant and ongoing love affair with the American Southwest. 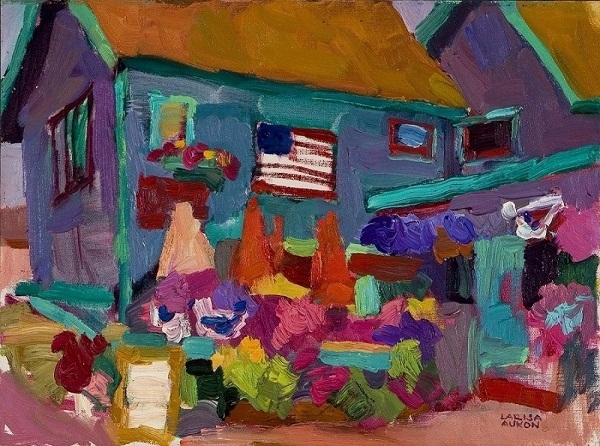 Even today it infuses her paintings with a vibrant sense of rhythm and aliveness-a quality that no doubt contributes to collector interest in her work across the United States and around the world. On an Arizona hillside that day, the artist also felt herself touching a lifelong yearning for deep connection with the land, which began in her earliest years. Winters in Latvia's northern latitude are long and dark. Filling her time as an only child, young Larisa spent many hours with pencil and paper. Her parents noticed her talent at drawing, and, when she was 12, they signed her up for entrance exams for admission into Riga's prestigious Janis Rosenthal Secondary Art School. Because the country was part of the Soviet Union at the time, tuition to the school was free for gifted students. But only ten were admitted each year, and hundreds applied. A weeklong series of rigorous exams tested the applicants' drawing and painting skills in all genres, as well as their knowledge of the fundamentals of art. Based on these results, the top students went on to undergo a second week of examinations, this time in academics. From there the school chose the select few. Aukon was one of these, although the institution's competitive nature meant all students were required to keep up a high standard of academic and artistic progress each year to remain at the school. Aukon studied there throughout her teen years. "Because the program was so intensive, we had to go to school six days a week: 20 hours a week just in art, and then academics on top of that," she explains. Sitting in her studio in the art district of downtown Scottsdale, the painter thinks back fondly on the small classes and the deep friendships she formed there. Adding to the experience was the remarkable quality of instruction she received, with all the school's art instructors drawn from the ranks of accomplished professional artists. One of these was a passionate, elderly painting teacher whose advice has remained with Aukon over the years. With a profound respect for art, the instructor always referred to painting as "her majesty," as if art was a royal figure. (Latvia's official language at the time was Russian, and in Russian the word painting is a feminine noun.) "He always told us: Never turn your back on her majesty, painting. She will never forgive you," Aukon recounts. What the venerable artist meant, she adds, was that if you are serious about painting, never put it off and say you'll do it later; do it now. She took his words to heart. After graduating from the Janis Rosenthal School, Aukon enrolled in the Latvian State Academy of Fine Arts, where she earned a master's degree in fine arts. 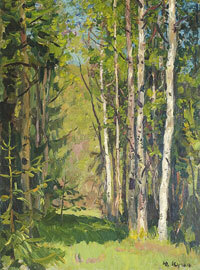 She continued drawing and painting as she worked in Riga at a series of art-related jobs. Eventually, her intuition said it was time to leave her home country and step out into something new. "I was like a dandelion," she says, laughing, "and the wind blew me to the United States!" Carrying rolled up canvases in her suitcase and a $100 bill in her pocket, she landed in Flagstaff, AZ, where a cousin's family was living. After the pervasive greens, browns, and grays of the Baltic region, the American Southwest was "like an explosion of color," the painter recalls. "I remember driving through northern Arizona and Monument Valley, and I was just in awe. The sky was 360 degrees, and I couldn't believe the color!" The Southwest's warm, rich hues find expression in works such as TIMELESS, a recent large landscape of bright mesas, hills, and trees. 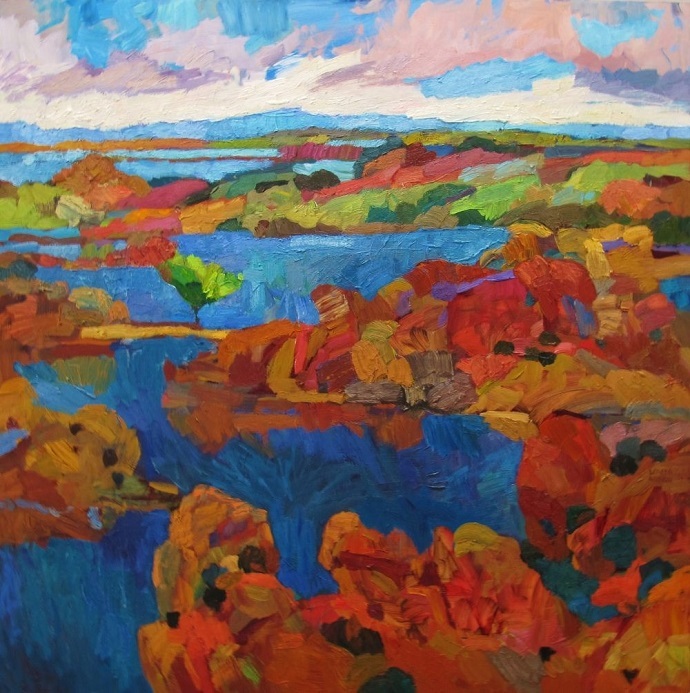 Inspired by red-rock landforms near Sedona, the artist's energetic brush strokes and complex use of color imbue the image with a feeling of intense liveliness, which she sees as more than metaphorical. "When I lived in Flagstaff I went to Sedona many times, and I was overwhelmed by the beauty," she reflects. "I never got jaded or used to this beauty. It's like a person has a heart and blood goes through their veins, and you can touch a person and feel they're alive. It's the same with the pulse of the land." Even as a child Aukon remembers being aware of the earth being very alive, although she could not have articulated it at the time. Whenever her family spent time in the countryside, she wanted to be barefoot and "play Indians," she says. "Always I was an Indian. It was a feeling that the land and trees are alive." Back in the city, her desire for connection to the land took the form of endlessly drawing and painting horses. Later she lost herself in popular books about the American West by such writers as James Fenimore Cooper, O. Henry, and Mark Twain. Today when she paints, Aukon aspires to tap into a personal version of what she calls the "inner pulse." She thinks of it as the subtle yet powerful cadence beneath the surface of things and associates it with a strong creative flow. Often she enhances this feeling by listening to percussion-based music in her studio, although recently she also finds herself drawn to the soundless heartbeat of silence. Working from the pencil and color sketches she does on location and photos she has taken, she combines these with impressions, imagination, feelings, and memories of the places she paints. While not a plein-air painter, Aukon gathers a range of materials on location and then uses them as reference once she's back in her Scottsdale studio with its generous north light. "Sometimes I think of myself as an actor-a good actor has to do a lot of research to becomethe character," she observes. "I have to get into this atmosphere, and then I can paint, in the most creative sense." 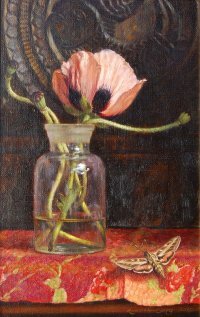 Images such as LANDING STARS, for example, represent Aukon's enchanted response to the profusion of wildflowers she experienced on a summer visit to Colorado. With bold brushwork and rich pigments, the painting conveys the exuberance of acres of wildflowers across a valley floor. Just as clearly, however, they reveal the artist's unabashed delight in coming across these scenes. "Never in my life did I see fields of columbines before. So huge, like a wildflower garden!" she recalls. Among Aukon's cityscapes, many are nocturnal, reflecting the long nights of her childhood home. Narrow, empty, often snowy nighttime streets feature close-quartered buildings with squares of light shining from a few windows. As she was growing up, the artist imagined these familiar scenes "like a stage for mystery or magic. It was all dark and then I'd see one, two, three lighted windows. I was always fascinated-what's going on in there?" The painting 5 TO MIDNIGHT was inspired by a night out in the city when she gave herself a deadline of being home by midnight or taking a cab home. "It was like from Cinderella. I had this idea: In five minutes all the windows will be dark and everyone will be asleep and it will be a totally different feeling," she says, smiling. Yet even with moonless nighttime imagery, the artist's trademark use of layers and strokes of intense color add a dimension of complexity and animation to these scenes. "It took me a while to dare to paint nocturnes," she acknowledges. "I didn't want to paint just dark and light-there are so many colors, I had to learn how to make it work." While Aukon's training was classically based and comprehensive-the kind of art education many representational painters long for-she found herself using a highly stylized approach in her first paintings in the Southwest. "I had that training, but I didn't want to use it. It was like a pendulum, and I needed to go in a total opposite direction. Then the pendulum comes back to the middle," she explains. "It took years to brew all this knowledge and experience, and now I'm very happy with what I'm doing." Her works are in many private and corporate collections throughout the U.S., Canada, England, Italy, Germany, Sweden, Poland, Latvia and Russia.